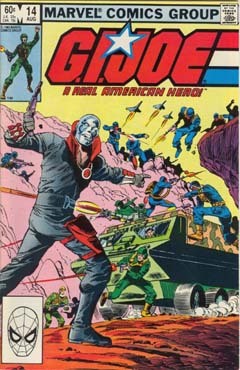 Episode 14 : Issue 14 Destro Attacks! We're back once again presenting for your listening pleasure. This time out, Aaron, Ryan, returning guest host, Jarrod Alberich (also known as The Yard Sale Artist), and Pat Sampson gather together to talk about the 14th issue of G.I. Joe: A Real American Hero. Then at 42 minutes in to the show, we look at the second episode of the regular cartoon with the second episode of The Pyramid of Darkness (The Pyramid of Darkness, Part 2: The Further Adventures of G.I. Joe). This episode first aired September 17, 1985 and was written by Ron Friedman. At 1 hour and 27 minute mark, we have Postbox: The Pit! (Which I somehow missed last month, even though I had it listed, so this month you get a twofer). Follow Ryan on to his other shows: Batman Knightcast, Power of Fishnets, and Midnight... The Podcasting Hour over on the Fire and Water Podcast Network. Join us next month as we look at issue 15 of G.I. Joe: A Real American Hero and the third episode of The Pyramid of Darkness with me and the guys.